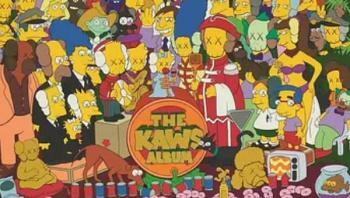 n November, another painting by KAWS, whose real name is Brian Donnelly, sold for a then-record $3.5 million. Last week, a 37-meter-long inflatable version of his signature character, called Companion, floated on its back in Hong Kong’s Victoria Harbor during the Art Basel Hong Kong art fair. Other items at the auction included two pairs of sneakers designed by KAWS for Nigo’s A Bathing Ape (Bape) line of clothing that fetched $16,000, and an 18.5-inch high KAWS figure based on the Japanese manga character Astro Boy, which sold for $303,000.